Arabian whales and dolphins are among the most fascinating and least understood of the world’s cetaceans. Over twenty species live in the region, where their habitat includes some of the most varied and biologically productive seas in the world. Author Robert Baldwin has spent 25 years in the Arabian region, much of it dedicated to the study and conservation of the region’s marine life, especially cetaceans. This definitive text encompasses the Arabian Gulf, Sea of Oman, Arabian Sea, Gulf of Aden and Red Sea, filling a void in our knowledge of Arabian marine life. 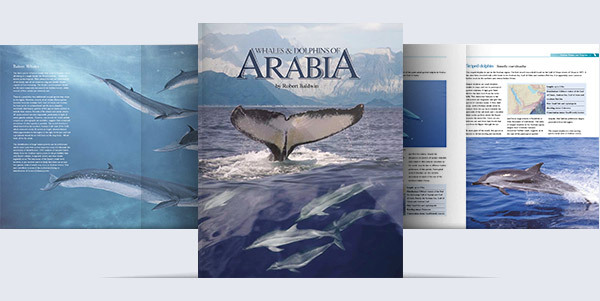 It provides a comprehensive account to each of Arabia’s whale and dolphin species, as well as an in-depth look at their natural history and conservation needs. Produced and published by Robert Baldwin, sponsored by Shell Representative Office, Oman. 111 pages. This entry was posted in Books, More Stuff. Bookmark the permalink. Both comments and trackbacks are currently closed.